"This subject came up several times over the years. When I was in college, all engineering students were required to take two courses - Material Properties and Application 101 and 102. The most important principle stressed by my professors was that ALL things deteriorate and are more likely to fail with age. Of course, some faster than others. This depends on the kind of material, what elements it was exposed to, and how hard something was used. Jim Cagle wouldn't have been repairing typewriters for 49 years if that were not true! Anyway, typewriter collectors want to believe otherwise in spite of the facts! The first thing that goes is the rubber, Celluloid, leather, and other 'soft' materials. 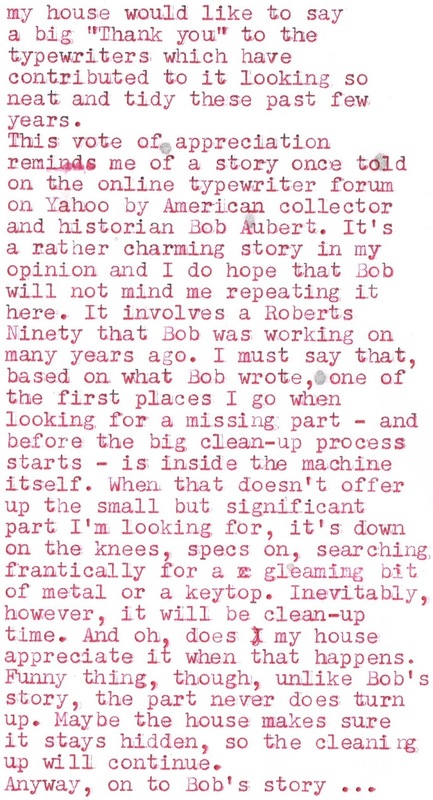 "When I began collecting, I found a Roberts 90 in a second-hand shop. This was a very rare typewriter manufactured in the old Blickensderfer factory during 1922. Lyman Roberts, its inventor, apparently licensed the design to the firm and it was sold as the Blick 90 prior to him taking over. Unfortunately he passed away soon after. I tend to favour typewriters which carry the inventor's name, so was pleased to find this one. 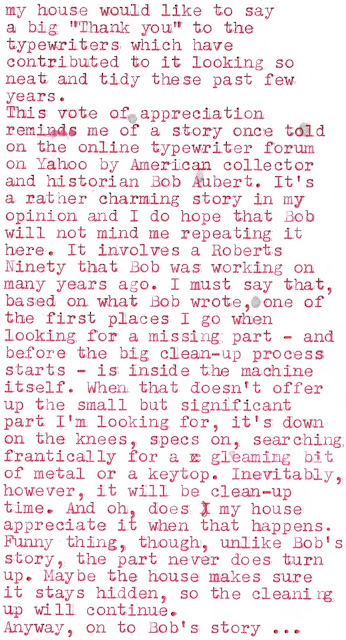 When it was brought home, I decided to type Roberts' Obituary on the machine, have it copied and share it with other collectors who corresponded with me. The piece was about a half-page long and it seemed like a neat thing to do. A few days later it was time to clean and polish my new toy. After starting on the type, I discovered two slugs were missing! Checked the Roberts Obit and determined they must have been there when it was done. Was relieved initially, since I knew they must be in my house somewhere. The first thing I did was shake the machine rigorously hoping the slugs would fall out. They didn't. Then I carefully searched all around the kitchen table where the obit was typed. Couldn't find them there either. After that, got down on my hands and knees and spent several hours trying to find them in the carpet of the living room and my office. The missing slugs weren't there either! So I began thinking about replacing them from another more common typewriter. Unfortunately, the ones missing didn't match anything else! Was so frustrated at that point, I put the machine on the shelf hoping the damn things would show up eventually. They didn't! "Well, everybody likes a story with a happy ending! About a year later, I took off the covers to clean inside my Roberts. While dabbing some naptha here and there, I found the two missing slugs wedged in the mechanism. Managed to retrieve and resolder them back where they belonged. Incidentally, do you realize that soft solder loses most of its strength after only 25 years? My typing on a rock hard platen obviously was not a very good idea! I knew better, but was so anxious to 'use' my Roberts, all caution went out the window! Oil will dry up whether or not you use a typewriter, especially if done on occasion! Some oils contain sulphur and when combined with moisture in the air, it becomes acidic. Over time, this will actually promote rust! I recommend cleaning a machine thoroughly with a good solvent and do nothing else. It will still type for demonstration purposes and you won't have to worry about it. If you don't keep your typewriters in display cases, I suggest storing them in clear plastic bags and use a vac to remove most of the air before putting on a tie. That keeps most of the moisture and dirt out and preserves the artifact for future generations. After a few years you would be surprised at what has accumulated on those bags! At that point, I usually put a new one ones. Sincerely, Bob Aubert." A little while back, while repairing a margin/bell problem on my SG1, I lost a small plastic washer meant to stop a spring from coming loose from one of the dowels. I searched high and low for this immensely tiny piece, but it was nowhere to be found. Well, you do have a Queen of Australia to invite to your house - I wonder about her typewriter? I don't know how many times I've dropped a little piece on the floor and simply been unable to find it again. It doesn't help that my basement floor has flaking green paint that acts like camouflage. Your house probably appreciates it more than mine. I often completely lose small parts, only to have them turn up again later. As such, I'm often petrified to vacuum around my desk, until all pieces are located and accounted for. I just stumbled on this post and got a real kick out of it. Somewhere around 2005 or 2006 I had the pleasure of visiting Bob's home, and where I had been expecting to see something resembling a museum (holy cow does he have a collection!) I found that while he does keep a number of machines on display, he also keeps a fairly large number of very rare machines bagged in plastic. LOL Imagine my surprise when he pulled a Crandall out of a plastic bag! I certainly didn't expect to see them in bags, but he's absolutely correct about using them for storage.